Milton Hyundai > Milton Hyundai > Gorman Family of Dealerships donates $250,000 to support the expansion of Milton District Hospital! Gorman Family of Dealerships donates $250,000 to support the expansion of Milton District Hospital! 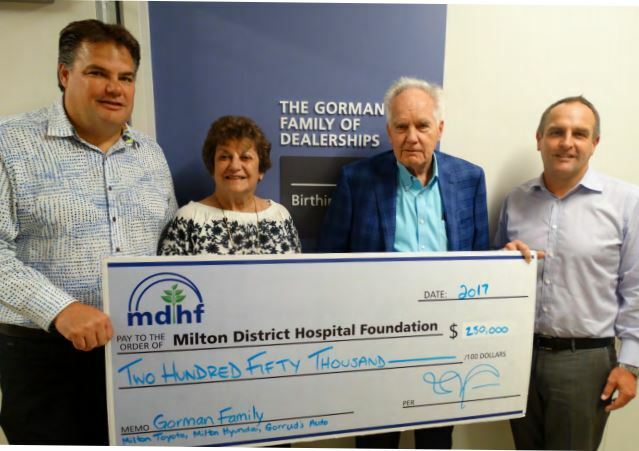 The Milton District Hospital Foundation is thrilled to receive a $250,000 donation from the Gorman Family of Dealerships which will support healthcare in our community. The Gorrud’s Auto used car business came to Milton in the early 70’s when Jim and Phyllis Gorman relocated to Milton with their four children Andrew, Patrice, Chris and Joel and became a full service used vehicle dealership. Andrew and Chris now oversee a growing operation that includes Gorrud’s Auto, Milton Toyota and Milton Hyundai, the family business now spans across 3 generations. In recognition of the Gorman Family’s generous donation of $250,000, the Birthing Suite Sub Department in the newly expanded Maternal Newborn Department will be named in their honour. “The community of Milton has always been near and dear to our family and we are passionate about our responsibility to give back. Our decision to support the Milton District Hospital was inspired by our personal experience with the hospital and our desire to support a cause that is significant to everyone who lives here”, says Chris Gorman, President, Milton Toyota.